Vancouver, BC, Canada – June 13th, 2018 – Equitorial Exploration Corp. (TSX-V: EXX, Frankfurt: EE1, OTCQB: EQTXF) (“Equitorial” or “Company”) is pleased to report the drill assay results from the discovery hole CT-18-02 in the Cat Tail Pegmatite. 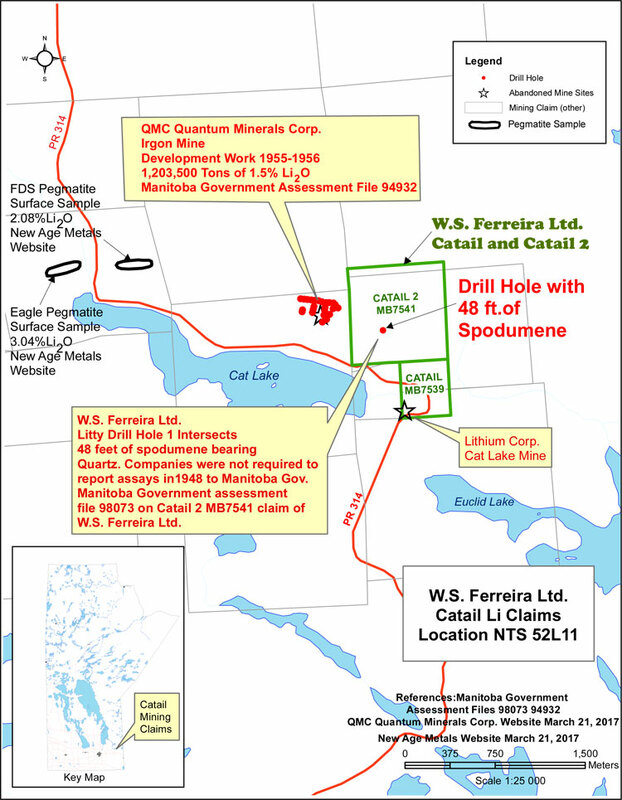 The discovery hole encountered approximately 36 meters of a spodumene bearing pegmatite (news release 3/19/2018) on its 100%-owned Cat Lake Lithium Property in SE Manitoba. This new pegmatite discovery is directly adjacent to the Cat Lake Mineral Project owned by Quantum Minerals Corp. Drill hole CT-18-02 was the second drill hole of the Company’s aggressive 1,256 meter seven-hole drill program. Drill hole CT-18-02 was positioned to intersect a possible extension of the Irgon Pegmatite system, presently being explored by QMC Quantum Minerals to the west of the company’s claims. The drill hole encountered 36.19 meters of a spodumene bearing pegmatite (true width not determined at this time) at a depth of 126.41 meters downhole or 90 meters below the surface. The hole was collared approximately 200 meters southeast of the last surface exposure of the Irgon Pegmatite. Prior to being drilled, the Cat Tail Pegmatite was buried with no surface expression. A weighted average of 1.90% Li2O was obtained over a mineralized length of 31.88 meters (true width not determined at this time) from the discovery hole into the Cat Tail Pegmatite. Three zones of spodumene mineralization were noted within the mineralized zone (Table 1), with the highest assay being 3.74% Li2O. The pegmatite is crudely zoned. With the favourable lithium assay results, the company will submit the remainder of the samples from the other 6 holes to the assay lab. Drill holes CT-18-04 and CT-18-06 also intersected the Cat Tail Pegmatite. Other pegmatites were encountered in the drilling but the Cat Tail Pegmatite is the most significant. The Cat Tail Pegmatite has been intersected over a distance of 50 meters and remains open along strike and to depth. At this time it is difficult to predict if the Cat Tail Pegmatite is a new pegmatite system or an extension of the Irgon Pegmatite system to the west. The core samples were sent to the Activation Laboratories facility, in Ancaster, Ontario for analysis. Samples were prepared, using the lab’s Code RX1 procedure. Samples are crushed, up to 95% passing through a 10 mesh, riffle split, and then pulverized, with mild steel, to 95%, passing 105 μm. Analyses were completed, using the lab’s Ultratrace 7 Package; a Sodium Peroxide Fusion which allows for total metal recovery and is effective for analysis of Sulphides and refractory minerals. Assay analyses are carried out, using ICP‐OES and ICP‐MS instrumentation. Equitorial Exploration implemented a QA/QC program for the drill program with the injection of blanks, duplicates and commercial standards at intervals throughout the sample sequence. Activation Laboratories has their own internal QA/QC procedures that it carries out for all sample batches. The drill program was supervised Carey Galeschuk. P. Geo, a consulting geologist with extensive experience in lithium bearing pegmatites. He also serves as Qualified Person for the purpose of National Instrument 43-101. Property situated directly east and along strike of Quantum Minerals’ Cat Lake Mineral Project (previously Irgon Lithium Mine). During 1956-1957, the Irgon Mine was an underground mining operation for spodumene (one of the hard rock sources for Li). The pegmatite had an historic estimate of 25 million tons of ore grading 1.51% Li20 (Mineral Inventory File No. 221). The property lies within the east-trending Mayville-Cat-Euclid Greenstone Belt (“MCEGB”) located along the northern contact of the Maskwa Lake Batholith. This northern greenstone belt has a similar structural geological setting as the Bird River Greenstone Belt (“BRGB”) which is located along the southern contact of the same batholith, and is parallel to and approximately 18km to the south of the MCEGB. The property is located 20km north of the Tanco Mine Property. The BRGB hosts the world-class Tanco rare element-bearing pegmatite dike as well as numerous other lithium bearing pegmatites. The Tanco Mine went into production in 1969 and produced tantalum, cesium and spodumene (lithium). It was previously North America’s largest and sole producer of spodumene (Li), tantalum (Ta) and pollucite (Cs). Equitorial has granted a total of 2 million incentive stock options to directors/officers/employees and/or consultants under the company’s stock option plan. The options are exercisable at $0.095 cents per share and will expire June 13, 2023. Equitorial is aggressively developing four 100%-owned, high-potential, lithium projects in North America. The Little Nahanni Pegmatite Group (LNPG) is a 43-101 compliant, hard rock, lithium property in the NWT. The Cat Lake Lithium Property in Manitoba, Canada is directly adjacent to the Cat Lake Mineral Project, a highly prospective Lithium property. The Tule and Gerlach Lithium Brine Projects are located in lithium-rich Utah and Nevada within easy reach of the Tesla Gigafactory #1. All four projects have demonstrated highly encouraging grades.